A New York Times #1 Bestseller! For over a century, the Court of Owls has ruled Gotham City in secret - their reach inescapable, their power unstoppable. Until they battled the Batman. Gotham's vigilante protector managed to escape the talons of the Court with his mind and body barely intact. The Dark Knight managed to win the battle with his deadly new aggresors, but certainly not the war. Batman was just the first part of their conquest. Now they have their sights set on something much bigger: Gotham City. 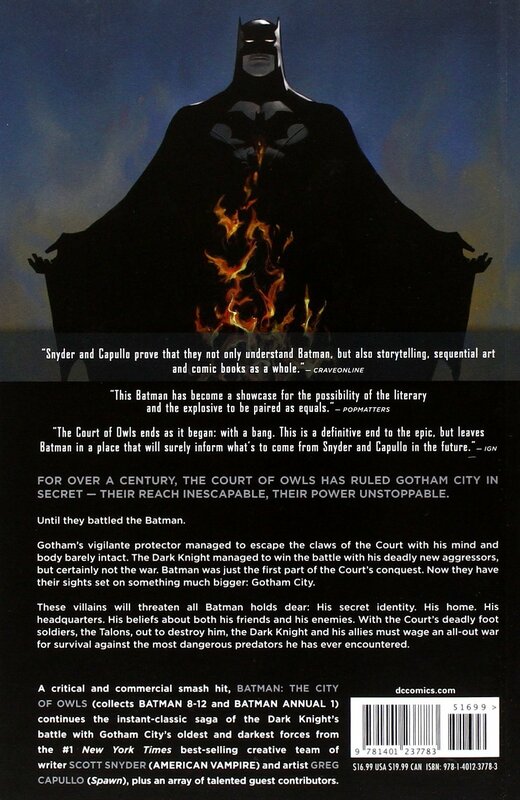 A critical and commercial smash, BATMAN: THE CITY OF OWLS (collecting BATMAN 8-12 and BATMAN ANNUAL #1) continues the instant-classic saga of the Dark Knight's battle with Gotham City's oldest and darkest forces from the #1 New York Times best-selling creative team of writer Scott Snyder (AMERICAN VAMPIRE) and artist Greg Capullo (Spawn), plus an array of talented guest contributors!